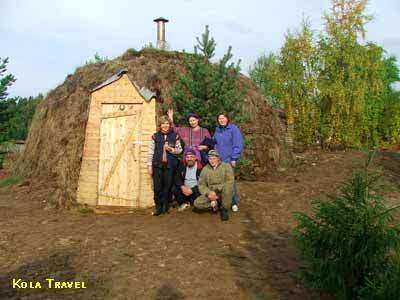 Ecological tourist base "Vezha" is located in a forest village Inga. The main building is the unique Saami Sot House built by principles of national Lappish dwelling "Vezha". It is a big round handmade wooden building and covered by ground and grass. Warm in winter and cool in Summer. 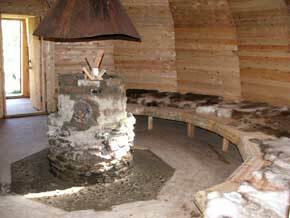 In the centre of the Vezha is an open fire place made of wild stones. Everybody takes place in this room. 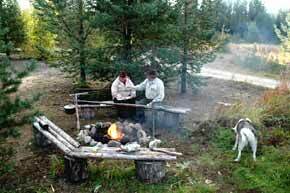 You will have your meal beside the fire and you will sleep on reindeer fur. 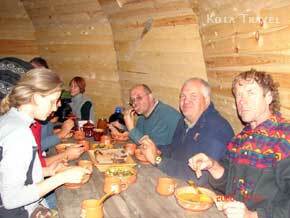 The Vezha can accommodates up to 20 people. It’s located 50 km south Oktyabrsky, Kirovsk deeply in the forest and beside the old gravel road between Kirovsk and Pomor village Umba on the White sea. It’s only possible to come there by 4x4 cars, quads, off-road motor cycles and bicycles in summer. In winter you can come there by snowmobiles and by cross-country skiing. Enjoy the beautiful and peaceful nature of the Kola!